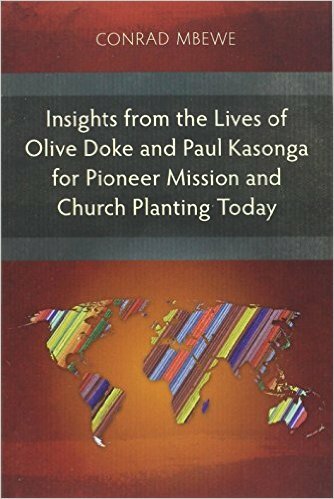 A Letter from Kabwata: The 2010 True Church Conference in the USA—and lots more! 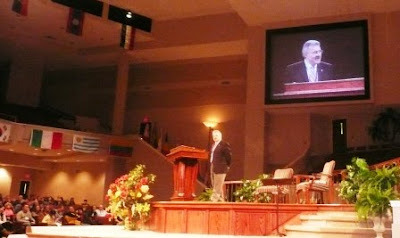 The 2010 True Church Conference in the USA—and lots more! This is a rather belated report on my recent two-week preaching trip to the USA. The Lord was gracious, and in answer to the prayers of his own people, Felistas and I travelled well and returned safely to both family and flock. The details of the trip are in this report. Our outward journey on 10th February commenced with some trouble for me. No sooner had I stepped on the plane than all hell broke loose in my teeth. My last remaining wisdom tooth was almost driving me crazy with pain. If I had pliers nearby on the plane I would have pulled it out myself! As the Lord would have it, our flight from Johannesburg to Washington was canceled due to weather conditions in Washington (they were also having the worst winter in years) and so we were marooned for the night in South Africa. That gave me an opportunity to buy some pain killers and placate the pain. However, as soon as we arrived at our first destination in the USA, i.e. 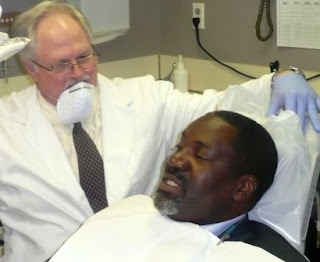 in Detroit, I went to see a dentist who recommended me to an oral surgeon, who then did the inevitable. The tooth was removed and, two weeks later, I brought it back to Zambia for a decent burial. In Detroit, we spent our time with Dan and LuAnn Chittock of Bethesda Baptist Church, the church that supports three of our church-planting efforts. One of them, Chisomo Baptist Church in Matero, Lusaka, had just been weaned after eight to nine years of church planting work. So, I felt like the apostle Paul going back to faithful partners to thank them for their partnership in setting a gospel dynamo into motion in the heart of Zambia’s second largest high density residential area. We trust that many years after we are all gathered with our fathers, this dynamo will still be reaping souls for Christ, until he returns to wrap up history. The icing on the cake in our Detroit visit was to be with my sister, Hope, and her family who live in Michigan. They came over to Detroit to spend Friday and Saturday with us. It was great seeing them (as the smiles here clearly show)! On Saturday morning, I preached at a pastors’ fraternal (see picture below)—in between the visit to the dentist and the visit to the oral surgeon. I spoke on the philosophy and outworking of church-based ministries. I am burdened that so many Reformed churches function more like buses than like bodies—the latter being the more biblical picture of the church. As pastors, we seem to be content with our members merely coming to church consistently to hear us preaching and teaching. As long as they are also faithful in paying their tithes and offerings, we do not trouble them. We assume that they are faithful in evangelizing family and friends on their own. That sounds more like a bus, doesn’t it? As long as passengers come and fill in the seats on the bus and pay their passenger fees, any driver will be happy to continue plying his trade. Similarly, as long as the driver does not hit into a pothole, the passengers will leave him alone and enjoy the ride half asleep. It is when he hits a pothole that they all wake up and hurl unprintables at him. Unfortunately that picture represents the state of too many of our churches. It is a far cry from God’s imagery of a church. The church is a body and everyone should be playing his role in an organized way to ensure that the purpose for which the body has been placed in God’s world is fulfilled. 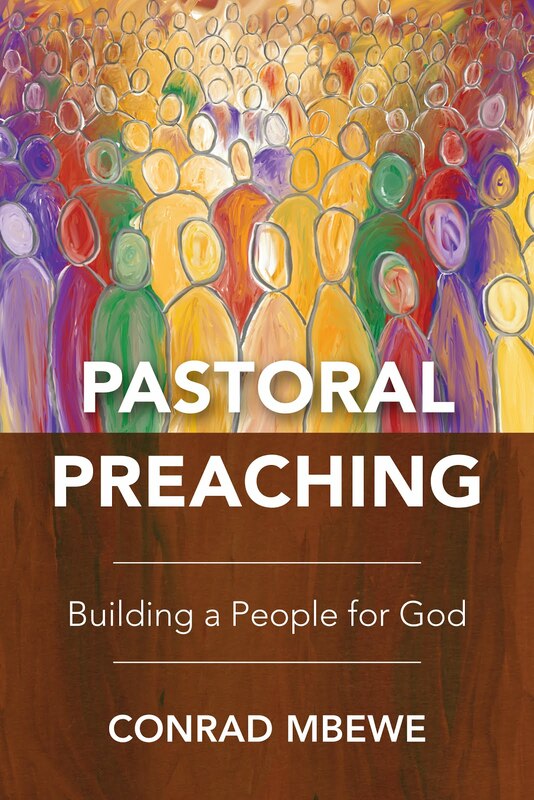 It is this concept of an every-member ministry in and through the church that I was urging upon the pastors and church leaders that Saturday morning. That evening, we had dinner at the home of the Chittocks with the outreach ministry team from Bethesda Baptist Church. It was a good time to really connect with those who we relate to by email across the Atlantic ocean. 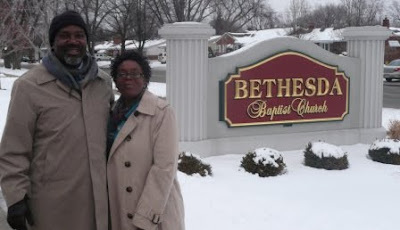 Sunday saw me ministering at Bethesda Baptist Church in the morning and at Inter-City Baptist Church in the evening. At Bethesda, I took up the Sunday School hour speaking about Kabwata Baptist Church and its ministries and missions work. I used the opportunity to also thank Bethesda for their consistent partnership in our church-planting efforts. Inter-City runs a church-based Bible College and a bookstore across the street. For my honorarium that evening, I was given a book voucher and then Felistas and I were ushered into the bookstore straight after the evening service. We stretched that honorarium to its extreme limit. Pastor Dave Doran (seen below with Dan Chittock in a jacket) threw in a pastor’s discount and some generosity in trying to contain our appetite. I am sure next time he will have second thoughts about releasing an African pastor in a shop full of literary candies without a leash! From the northern end of America, on Monday 15th February we flew right across the USA to the southern end. 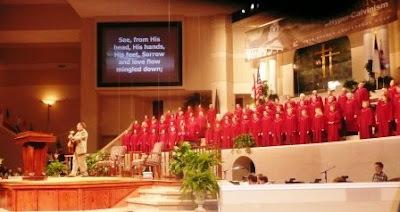 We went to Pensacola, Florida, where we visited the Mount Zion Bible Church. Here in the middle of nowhere is a small church that is reaching the world through its literature ministry. Is there any corner of the world that does not have Chapel Library literature? I doubt it! It was good to attend a Bible study on marriage led by their pastor, Jeff Pollard, where The Free Grace Broadcaster was being used as extra reading for those in attendance. So, they don’t just send out this stuff for us to read; they also use it themselves! We were unable to visit with Jeff the following day because he fell ill that same night. But it was good to spend time with Clarence Simmons (and his family) who showed us around the printing rooms and the warehouse (see photo below), and with Steve Frakes who gave us a run down on the operations of Mount Zion, including their far-reaching correspondence course. I came away feeling as if we had been scooping water out of the Zambezi River gushing out of the Kariba Dam using a tea spoon. That evening, I resolved to return to Zambia and turn KBC into a Chapel Library partner that would ensure that the God-honouring literature pouring out of this small church would be used of God right across Zambia—for the salvation of the lost and the sanctification of God’s people. I preached that evening on the greatest incentive for soul winning—a passion for the glory of God. What other theme would be more appropriate for a church that is spending and being spent like this to reach the world? We left Pensacola on Wednesday 17th February with our hearts enlarged. On our way to Muscle Shoals, Alabama, we stopped over for a night in Nashville, Tennessee, where we were hosted by the YMCA of Middle Tennessee (see photo above). This is my last year as President of the Zambian YMCA and so Felistas and I spent time with the leadership of this YMCA talking about how they could partner with the Zambia YMCA to help with some of our social programmes. It was good to meet Barbara Suttons, Gary Cobbs, and Ken Strawbridge again. I last met them in 2008 when I last visited their YMCA. They really took great care of us and treated us like foreign diplomats. Since they were just reorganizing their international relations department, we could only talk generally about possible areas of partnership. We look forward to seeing this partnership growing for the sake of our vulnerable young people back in Zambia. Finally, we arrived in Muscle Shoals on Thursday 18th February. To get there, Ken drove us from Nashville to Huntsville, where we linked up with Justin Cosby from the Grace Life Church of Muscle Shoals. 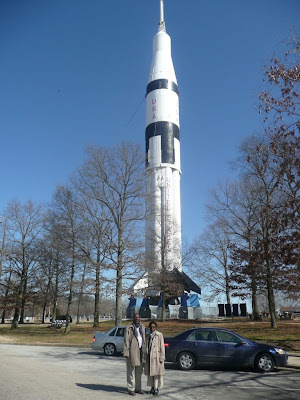 In Hunstville we briefly stopped over to see one of the three remaining Saturn Vs (see photo). It was one of these that took American astronauts to the moon. Well, it was good to finally meet Justin again. He took charge of our lives from that point until the following week on Tuesday when we took off for our homeward flight to Zambia. We literally took him away from his wife, Sarah, and their son, Titus, during the entire period of our stay. I mean, all we needed to do was to cough, and Justin was there! 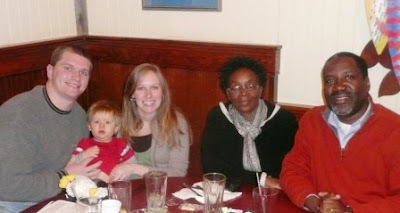 I am glad we were able to have our final dinner with his whole family (see last photo below). While in Muscle Shoals, it was good to spend some time with Chad Thompson, who is working around the clock to publish what will be my first normal-length book. We went through the whole book, seeing where we needed to fine tune the contents. I am truly grateful for his labour of love. It was also good to spend time with Anthony Mathenia, the man who enabled the Zambian Reformed Baptist fraternal to extend its ministry into Ethiopia. We talked about the growing ministry there and its potential impact among the churches. Please remember to pray for this man and for the teams of pastors we are sending into Ethiopia for training church leaders and church planters. As for the conference, it was as superb as ever. The singing—the very thought of it fills my eyes with tears. Thomas Clay and his choir always leave me mau-less (i.e. speechless) as they lead the congregation of God’s people in worship (see photo above). They put heart and soul, time and talent, into the singing. Let me put it this way: The singing alone is worth the price of the air ticket across the Atlantic! When Jeff Noblit said towards the end of the conference, “You can take Thomas Clay out of the Assemblies of God, but you cannot take the Assemblies of God out of Thomas Clay,” I could not agree with him more. I think I have finally found the secret to that brother’s love for the doctrines of grace and the ancient hymns, with lyrics so powerfully modified for today’s worshipers. 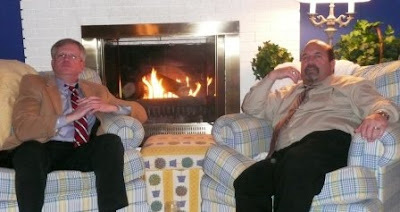 The theme of the conference was “The Quagmire of Hyper-Calvinism”. The attendance was slightly lower than last year. Whether this was because of the theme or because of the absence of some big names (e.g. 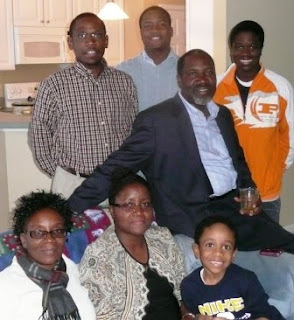 last year’s Paul Washer and Voddie Baucham) is difficult to say. The heartbeat of the conference was about serious and fervent soul winning. This was ably brought out by those who preached—Jeff Noblit (the church’s pastor), David Miller (with his unique style of country preaching), Jonathan Sims (a fervent expository preacher who will, God willing, be preaching at our annual Reformed Conference in Zambia in 2011), Michael Haykin (one of the most outstanding Baptist historians today, seen below as he spoke on Andrew Fuller), Barry King (who is doing church-planting work in the hard soil of London)—and yours truly! The conference also had “breakout sessions” (what we call “electives” or “seminars”). These were handled by the elders and leaders of Grace Life Church. They covered such topics as eldership, biblical counseling, small groups, outreach visitation, parent-driven children and student ministries, church discipline, courtship, counseling seekers, pastors’ wives, and conflict resolution. Jeff Noblit closed the conference on the morning of Sunday, 21st February. His closing address was basically an exposition of the church’s strategy statement for world missions. It says, “The entire local church family personally and strategically involved in world missions and church planting, increasingly mobilising labourers, prayer and finances to the end of glorifying God among all peoples.” At some point during the conference he had said that Grace Life Church has 200 to 300 church members out in the streets knocking on doors for evangelistic purposes every week. I ask, why is this kind of organized evangelism so rare in our circles these days? I'm wondering why you sing hymns - if you are a Reformed Baptist church. Do you not believe in the Regulative principle? Perhaps I will only briefly comment on Tom's comment. I believe in the Regulative Principle. I have taught definitively on this issue at Kabwata Baptist Church. My understanding of the Regulative Principle does not preclude hymn singing. 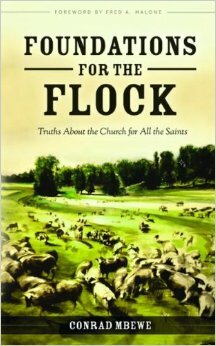 What I taught will be part of a book on the church that is soon to be published in the USA. So, thanks for raising the questions and... watch this space!